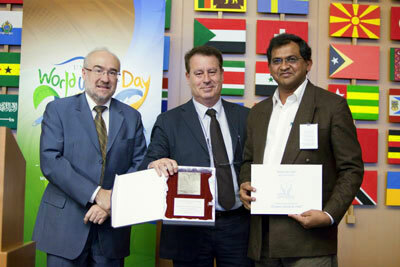 On World Water Day, 22 March, the 2012 edition of the 'Water for Life' UN-Water Best Practices Award was presented to winners during the official World Water Day ceremony which took place in FAO Headquarters, Rome, Italy. The Award was introduced by Mr. Michel Jarraud, UN-Water Chair and Secretary General of the World Meteorological Organization (WMO), who presented this edition's main figures and a video on finalist candidates. Mr. Leo Saldanha, Coordinator of the Environment Support Group (ESG) receives Category 1 Award from Mr. Jarraud and Mr. Blasco. The Award was presented to the winners by Mr. Jerónimo Blasco Jáuregui, Councilor of Culture, Education, Environment and Civil participation of the Municipality of Zaragoza, Spain. Category 1 Award in its edition 2012 was awarded to the project 'Protection of Bangalore Lakes for Posterity – Setting a Legal Precedent for Conservation of Lakes as Commons', for its outstanding contribution towards the conservation of waterbodys in Bangalore, India, and its demonstrable and tangible impact on the food security of peri-urban and rural communities in the region. 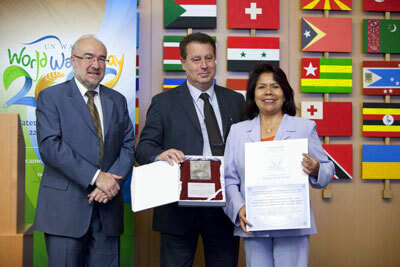 Ms. Elsa Sánchez, Executive Director of the SODIS Foundation in Bolivia receives Category 2 Award from Mr. Jarraud and Mr. Blasco. Category 2 Award in its edition 2012 was awarded to the project 'A communication strategy for social and behaviour change through the promotion of three key practices and the adequate use of services in four municipalities of the Department of Cochabamba, Bolivia', for its participatory approach to community-based empowerment and awareness raising, especially among vulnerable groups, and its outstanding contribution to addressing key challenges related to hygiene, water and sanitation in the region.